This topic contains 16 replies, has 3 voices, and was last updated by Funkmachine7 2 months, 2 weeks ago. It was not much of a marriage, just some belated gift giveing with out any kind of ceremony as Iarrarl gave Amalie a gold torque and she a bracer inlayed with silver in return. Amalie was smaller, a head shorter then her partner with long flowing brown hair and deep blue green eyes. The nears anything got to ceremony was Fjorleif’s tattooing of Iarrarl’s cheeks, the thick scar being filled in to a vibrant blue. By the third day after the duel the weather turned, a cold icy wind started blowing down from the north. A new energy took over the village, we hunted game at a rate i’d never seen before, it was race against the cold and worse, much worse. And it came the long night of winter and in that night, down from across mountains they came, a hordes of bandits and marauders. I had been lead to believe, falsely as i would come to know, that the Thulean wastes marked the edge of world. After all it was the place where the land turned in endless ice and snow. Fjorleif told me what lay beyond the wastes, the Riphean Mountains, jagged shards of ice the reach up in to the sky. And after that a world of fire and ice, a place where the Titanomachy still held sway in a massive fortress of black stone. 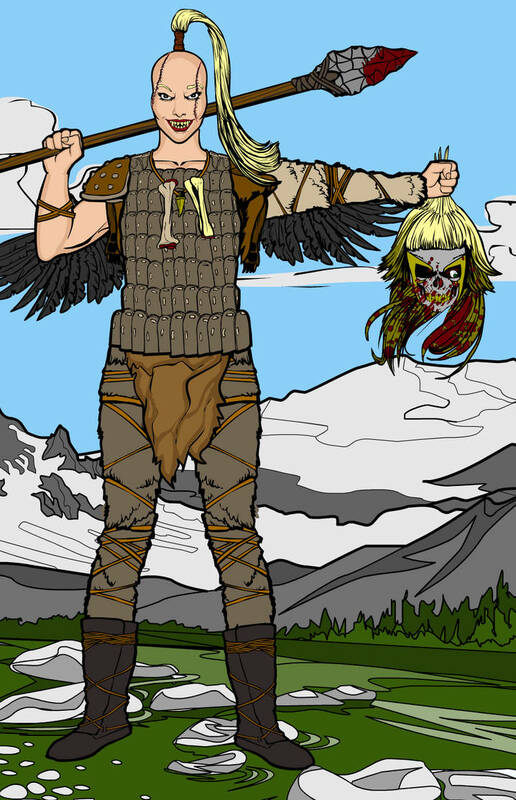 First Against them was Fjorleif the Skull Maiden. 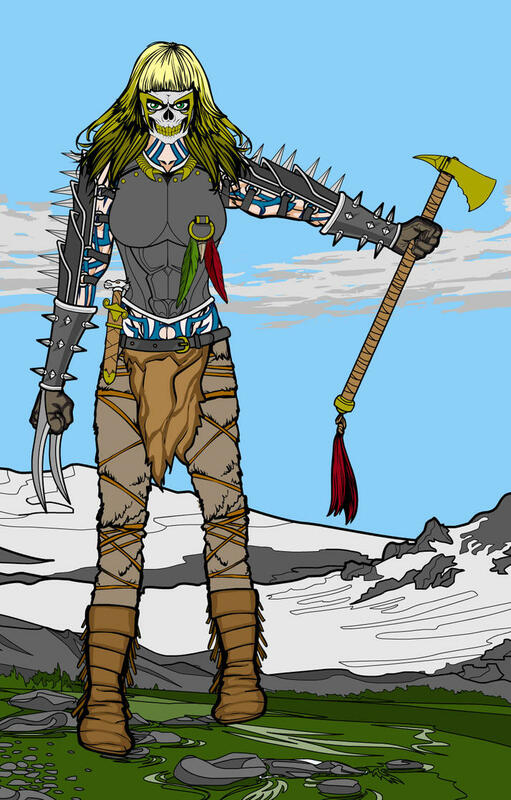 She was a terrible sight, a giant of woman her face hidden behind the silver skull mask, body clad in a heroic cuirass of blacken steel and arms covered in spikes each point glinting in the winter sun. It was a bitter cold, the air stung with flakes ice. For a week we waited, every on man woman and childs sharped weapons, and waited. We waited for them, as the wild hordes gathered out side the walls. The first to fall was the strongest of us, Fjorleifr the skull maiden. One moment she joked and laughed at there arrows, catching a spears from the air and hurling them back. The next moment the horde was on top of us, in a flury of blade, a shaven headed brute stepd forward and sliced the head clean from Fjorleifr the skull maiden shoulders. Fjorleifr fell dead, and the battle weighted on us. The wild men had only stone blades and no real armour but a greater weight of numbers, it was with the bloody power an force of arms that es forced them back. But the warrior stood be for the walls, holding Fjorleif’s head , one eye hung lose.